It is not fair to mentions individual fathers and this may take be considered as separation by itself. However, I agree on the issue mentioned. You are really trying to disseminate your need not of what should be done for the Church. Previously we were saying the Synod should make decisions. Now you are trying to void the decisions by the Holy Synod. You are making discrimination among the fathers. Really You are making bad things. Your hidden agenda is being revealed. what a woderful article about abune Abrahm. he is one of the fathers who are tring to follow God words. I didn,t see anyone at his position who said i can be mistaken , please tell me that.kentu wedase endihonebo lelawen alenagrem .our fathers please don,t let make this mistake .Abune Abraham suppose to be in atleast a few more years. I am amazed by the silence God I wonder why He can't give us a solution with Abba Paulos. I pray that He will keep Abune Abreham here so that, with the help of God, he can finish the wonderful work he has started. May God hear our prayers!!! Abd el Anna from L.A.
Ho my God tadelachu Dc yalachu memenan endh yale abat bemagegntachu edelegnoch nachu egna gen BE JERUSALEM YEMINGEGN MIMENAN EREGNA ATEN YEHEW HIZBU TEBTNO TEFTOAL minew Abune Matiyasen bikeyrulin ena endh yemisera abat bilakiln abune matiyas betam LEZEBTEGNA ,SELERASACHEW ENJI SELMIMNU YEMAYASEBU ,HIZBUN ENA SIBKETE WENGELUN YE eMBASY BALESELTANAT LESEBSEBA HIZBUN LEMANAGER SIMETU BECHA KALHONE YET NACHU MIN EYTESERA NEW BELEW yemaymelketu abat nachew betam tesfa adrgen neber esachew tenstew ende Abune Qewustos hizbun be enba eyastemare yemisebseb abat nafekenal ebakachu be ALEM yalachu mimenan Jerusalem yalechwan gedamachun ena hizbun betslotachu asebu asebu asebu yehenin selachu enbayen eyafeseskugn new min alebat bezu abatoch alu aydel wey endet techgeru belachu tasebu yehonal neger gen abatoch bemulu wede ager bet endaymelesu selmiferu ena be edemem yareju selhonu yemisemut ye Aba Paulosen demts new hulum lerasu enji lehizbu ged yelum be samint ande enkun lemikedsut kedase eytenechanechu new becha ye DC mimenan andent saneb weste tenekana besoten lemetsaf tegededkugn egna ezh be menafkan hizbachin eytwesedbebn alekoal EGZIABHER LELIJOCHU YEMICHNEK ,YEMIYASEB EWUNETEGNA ABAT YESETEN ZEND TSLIULEN PEASE .Min albat balfew abune Matiyas be voa sele abune Paulos aseteyayet sisetu bezuwochachu adenkachu yehonal gen negeru ALESEMEN GEBA BELEW new mejemriya esti hagere sibketachewun yatenakiru hizbun ewenetegna eregna hunew yimiruany way sele Jerusalem gedamat zirzir huneta lela gize besefiw yemitsflachu yehonal yene Aba Paulos kegn ejoch ezhim aluna eskezaw ebakachu ahunm bedegami yemasasbachu yetewededachu mimenan hizbachin betkula eytentek newuna tsliulinn. አባቶቼ ብጹዕ አቡነ አብርሃምን ማንሳት ለምን አስፈለገ? ለሚዘዋወሩት አባቶች የዝውውራቸው ምክንያት ምንድነው? ለመሆኑ ፓትርያርኩ ምክንያታቸውን ያቀርባሉ? አሳማኝስ ነውን? I have accepted the "egizene"idea. In one side, we are saying the holy synod is doing good thing and in other side he is making bad.Is that good? Please, this is undemocratic. Where ever Abune Abrham or else is assigned it is for the development of the church. As other dejeselamyawin commented try to make the issues genral, please donot mention any individual. Who knows Abun Petros will be also a better bishop, Abun Abraham may do good things in our Abent school and monasties in Gojam. Once again, the Holy synod has prevailed! The Europe and N. America Arc bishops will not be transferred. They stay where they are. Thank God for the wonderful decision by our fathers. I love the service of Abune Abreham. But i was extremely disappointed how some zemarians and alleged clergy are disappointed over his assignment in another spiritual mission. When was St Peter and St Paul and other evangelists and disciples sat in one place and ever felt mission accomplished? I denounce any sentiment that makes bishops and arch bishops indispensable for one location and one responsibility alone. By the way who is so demeaning to Ethiopia that says do not go back to that Kidist Hager! If Abune Abreham is the best for America, so desrvingly he has to work for christians in other places including those in Ethiopia! I think DC area Politicians and many wolves in sheep's skin must have infilterated the christians in DC area to stumble Abune Abreham and to soil his spiritual mission. 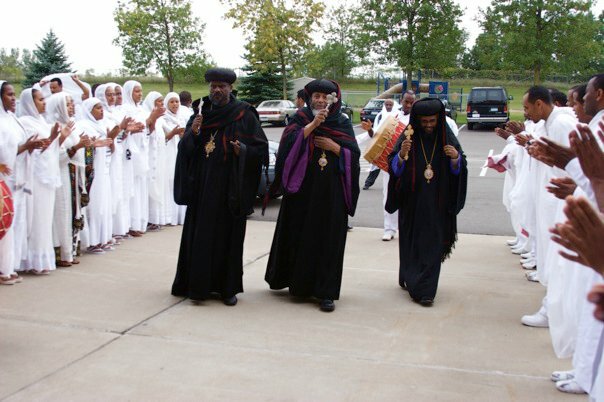 If I were in a position of authority within the Holy Synod, I would have Abune Abreham assigned in the remotest areas of Ethiopia where Menafikan and stiff-necked atheists are roaming. If he is so devoted and capable of giving exceptional spiritual service to us here in DC area,then I want his grace and service to even save thousands of strayed sheeps in Ethiopia in varying places. I want him to go back to Ethiopia immediately to save the daily lost flocks in various regions of Ethiopia and not rub his shoulder here in America with deceptive Christians. I feel that he lost his quality spiritual leadership time by spending energy and time on unproductive interlocution with divided Christians who very well know that if they live with sin and transgression they will inherit Lucern's Kingdom. I rather want him to open the eyes of the uneducated and the unlucky pagans and non-christians living in rural and remote locations of Ethiopia. I want him to teach, baptize and convert thousands and even millions of lost flocks who never knew Jesus Christ, his blessed mother St. Mary and the various holy saints. Please stop the hypocracy of sending the wrong message by insisting his stay in DC when in fact his spiritual and evangelical knowledge, preaching and christian service is badly needed in Ethiopia where the culture and crass materialism of Babylon is abounding. Let me assure you in DC area, we are very lucky to have the best preachers and priests to keep the original orthodox faith and canon. We do not even need any bishop or archbishop until the divided Synod is reconciled and our spiritual leaders come to their senses to respect each oyther and to be truly devoted to God by living the way Peter, Mark, Mathew, John, Luke, Paul, James, Timothy, Barnabas and others lived.Unity in the spirit of the Holy Ghost!! Be mejemerea kelaye yalewune yetsafute gelesebochem yehune budenoch manenetachewune bezerezer metekese alebachewu, Be defenawu "ye akababiwu ..." yemilewu ayegeletsewum. Enem ezihu akababi silalehu enene yemiwokele ayemeselegnem. Beterefe egna yemenedegefewu siwosen AMEN neger gene sanefelegewu sinekere BE FITSUME malete yemigache hasabe newu. Sile abune abereham hulune lemenagere merejawu bayenoregnem ene enkuwane ke mawekewu, be akababiwu yalu be teleye ke geleletegna bete kiresetiyanate abalate wotachen bemeyaze mejemeria be mister wuste wustun sera seretewu sijemere yegeleletegnochun senebet temeherete bete kezam ketechale demo betekelalawu betekerestiyanun le masamets ena belom lemaferese yeteserawu sera kelale neber? Degemos yehe newu weye andenete mamecha menegede? Beza laye gena bemadege laye yalu wotatochene yezo negere gene lelochune abatoch wede gone arego yeteserawu sera yemiresa newu? Le abenet ahune tekelehaimanot yalu agelegayochene eyu ke ye senebet temeherete bete yetemelemelu bichilu sewu yezewu endimetu kalechalu demo erasachewu telewu awegezewu endemitu yetederegu nachewu. So ezih laye abatachene tesasetewu neber elalehu - negerachewune ke lejoch gare neber yaregute. Esti negerugn ande abate ke lela betekerestiyane ahune aberoachewu yale? Be tegegnewu agatami "Ye taote bete" weyem "Gebeya" eyalu lelochune meweref yemayeferu lejochen meyazachewu newu netebe yasekoterelachewu? Adarashe atasetemeru yelu yeneberu adarashe sega ena demun mefetete newu yemikelewu? be gelesebe bete tesebesebo leke ende abiyote mefenedate yale akuwm yezewu yetenesu wotatochen yezo le betekeresetiyanachewn meneme mefetehe ayehonem. Ategebachewu yalu wotatochen ashagerewu hulum meemn biyasebu melekam yemeselegnal. lelawu seru weyem eyeseru newu yetebalewune negere Geta ke fitsme endiyaderesu be andem be lelam yeredachewu. Abatachene egnam lejochewu ne ena ebakewone be semete wuste honewu hoye hoye kemilu wotachew alefe belewu yeyun. Deje selamoch bitawotulegn des yelegnale. Kale honem enanet anebebachihutal. Why do you waste your time trying to disseminate useless accusations about a father whose works speak for itself. I see that you are not very happy with the fact that His Grace, Abune Abraham is staying to finish the work he has started by the will of God. Do not pin your problems on Sunday school students and “mezemran”. We know what is true and what is a lie. We are not falling for your traps. I know for sure that you and your cronies are scared the fact that many children of God are going to know about the true teachings of our faith and come back to their rightful place through the teaching and actions of His Grace. This is God’s will that His Grace is staying to continue the good and “Tewahido'awi” work. Stop deciphering your poisonous thoughts and come to your senses, repent, and start to serve the house of God. God does not hold grudges. May the God of Abraham, Isaac, and Jacob help His Grace to continue the good work and keep all of us to stay on the right track, which is Tewahedo. Amen!!!!! You do not speak for all of us. Abune Abreham is a member of Mahebere Kidusan. that is why you are trying to save him. I think you didn't read my writing very well. I said may God help Abune Abreham to finish his work and that I don't know that much about him....!!! Anyways I was talking about the things those youths were doing while they were in other church service. As I know chirstiniaty is soemthing that you witness on an open stage but not soething you do wiht secret without showing your true intention. What those (current servants of God in Tekelehaimanot) wer doing is that acting as if they are going to take part in a revolutionary type of fight for there church and they start by declaring the war in one of the young private house. May be you are part of that group and you may recall teh advice given to these youngs not to do such act by the name of saving the our church. If you are not one they will rememeber for sure. During this time Abune Abraham was reminded that he is working with kids but not with Abatoch and to reconsider the strategy by some church fathers. Ezihe metomere mechale eko lelayegnawu bete meserete lemetal beqi ayaregem ... wendeme Ze Amde Himanot. Be cherenetu yemarene enji, egnas seram yelen. Giving respection and recognition for the job he done is good but please do not rush to admire and over recognize. This time it is very very hard to get a religous father who protect and devote all his effort after his hiden agenda. God be with us!